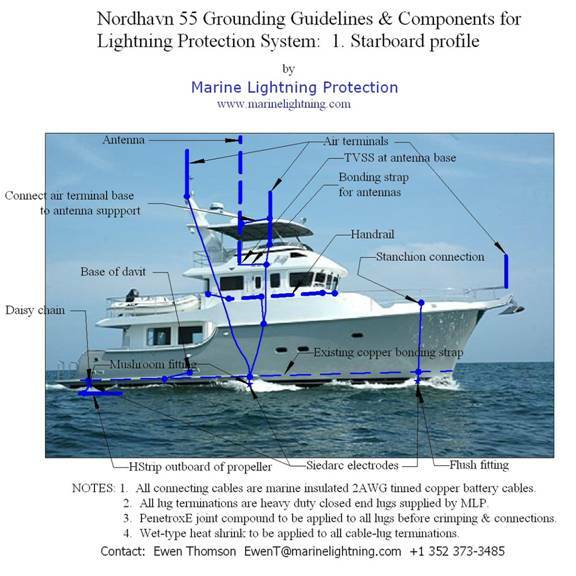 NOTE: While this installation was done on a new Nordhavn, the copper bonding strip installed by Nordhavn for galvanic bonding can also be used as the backbone of a retrofit lightning protection system. See Lone Wolf, a Nordhavn 62. 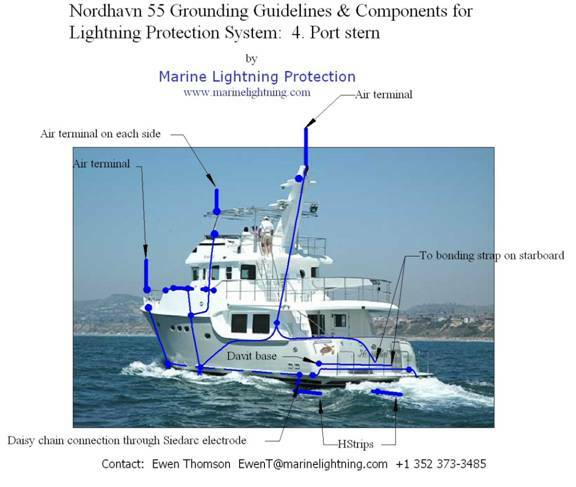 The lightning protection system comprises an interconnected network of air terminals, conductors, and grounding electrodes that form a conducting grid outside the interior space of the vessel. The protective zone provided by the air terminals gives coverage over all deck area and interior space. 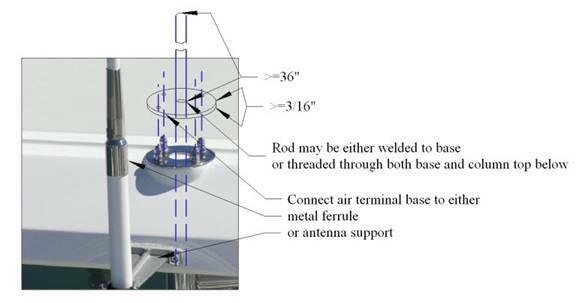 Since the VHF antennas mounted on the fly bridge are not included in the protective zone, roof top connections are made between each antenna support and the closest air terminal and a transient voltage surge suppressor (TVSS) is connected in each antenna cable. Down conductors are preferentially routed externally to all wiring, plumbing and occupied regions, the exception being the down conductor leading from the air terminal on the centrally-located instrumentation mast. Three continuous loop conductors are incorporated into the network:- (i) the existing stainless steel in the fly bridge superstructure; (ii) the stainless steel railing at main deck level, and: (iii) the existing copper bonding strap about 2' above the waterline. 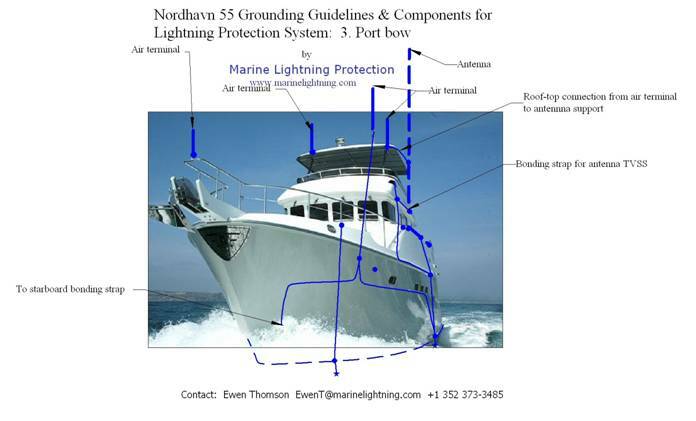 Grounding is provided via six Siedarc electrodes - one on each side at bow, amidships, and stern – and two 0.5 ft2 immersed grounding strips near the stern, one on each side outboard of the propellers. All grounding electrodes are preferentially installed above and near the waterline. 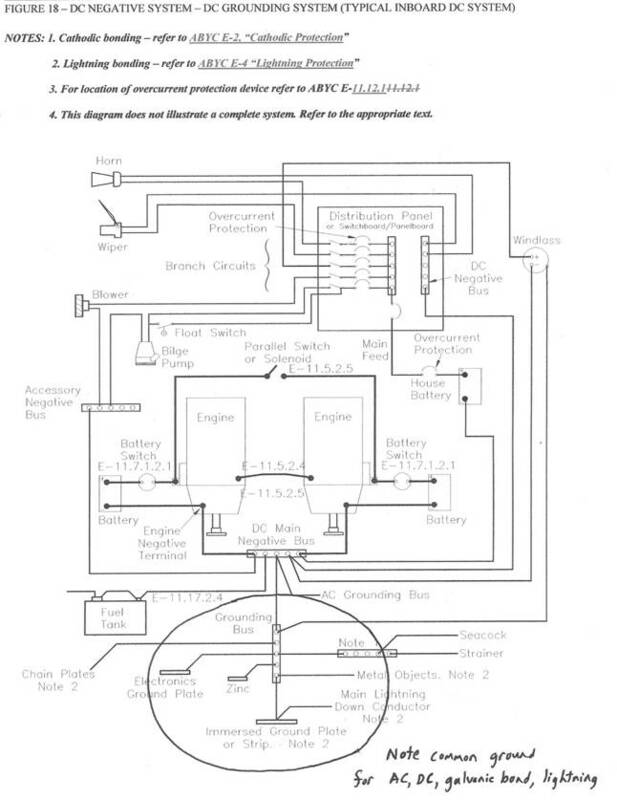 Major features are summarized in the diagrams in Appendices 1 to 6. Appendix 7 is a copy of Figure 18 from ABYC Standard E-11 showing a common connection for DC ground, AC ground, cathodic bonding ground, and lightning bonding ground. Appendix 8 gives instructions for lug terminations. The preferred air terminal is constructed from ½" solid copper rod with a rounded tip, tinned to a thickness of at least 0.3 mil. Alternative materials are ½" or thicker stainless steel, aluminum or bronze rods or pipes with a wall thickness of at least 120mil and an area of at least 0.3 in2. It is recommended that the bow air terminal be attached directly to the top of the bow pulpit, as shown in Appendix 5. The tip height should be 7' above the level of the floor of the bow pulpit. Presently the fly bridge roof is supported on stainless columns that are secured by means of a stainless ring on top as shown in Figure 2‑1 below. If the stainless ring is replaced by a solid disk of 3/16" or more thickness, then the air terminal can be either welded to this disk or, preferably, screwed through both the disk and into the column flange below. In the latter case the air terminal could be a commercially available ½" tinned copper rod with a ½" -13 threaded base. The antennas mounted on the side of the fly bridge are not inside the zone of protection and are likely to struck by lightning. This would destroy the antenna and produce a voltage surge on the antenna cable that could damage both the receiver and other onboard electronics. While it is impractical to ensure the survival of the antenna itself, protective measures are highly recommended to reduce the likelihood of damage caused by the voltage surge. As a first precaution, a conducting connection at least equivalent to 2AWG copper (0.04 in2 for copper, 0.25 in2 for stainless steel) should be made between the base of the air terminal and either the metal ferrule on the antenna or the antenna support. Additionally, transient voltage surge suppressors (TVSS) should be installed in the antenna coax as close as possible to the air terminal. These are preferentially mounted on common buses, one on port and one on starboard as close as possible to the point where the cables pass through the coaming. Presently a lightning dissipator is mounted on a stainless bracket at the top of the main instrumentation mast. Scientific opinion is solidly against the use of these devices. However, its location is an ideal place for a regular air terminal. Appendix 5 shows the recommended height for this. A commercially available 48" or ½" tinned copper rod with blunt tip is sufficiently tall if it includes all mast head electronics within a 90-degree apex cone of protection. Such a rod can be attached by means of ½" -13 nuts above and below the present supporting bracket. In this case a ½" hole should be drilled through the support. 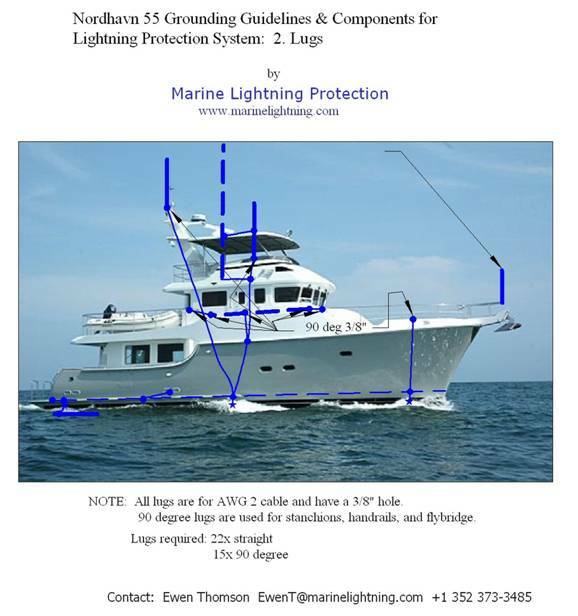 Appendices 1, 3, and 4 show suitable paths for lightning down conductors. 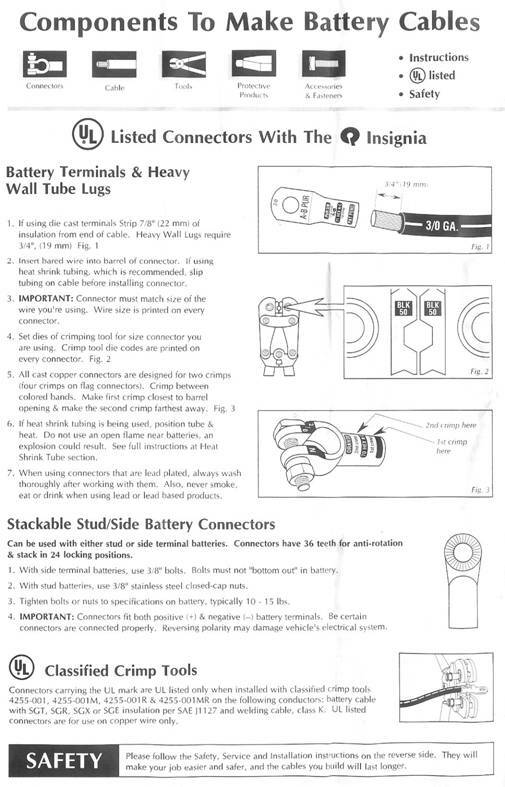 All down conductors should be made from insulated 2 AWG tinned copper battery cable terminated with the heavy duty lugs supplied by Marine Lightning Protection (see Section 3.3.1 and Appendix 8 for termination details). In general, the preferred route is the most direct path from air terminal to the closest grounding electrode with all direction changes by means of as smooth a curve (large radius of curvature) as possible. The existing stainless steel superstructure in the fly bridge forms a continuous loop around the fly bridge, although it is tortuous in parts. The handrails at main deck level also form a continuous loop if all lifelines are attached. 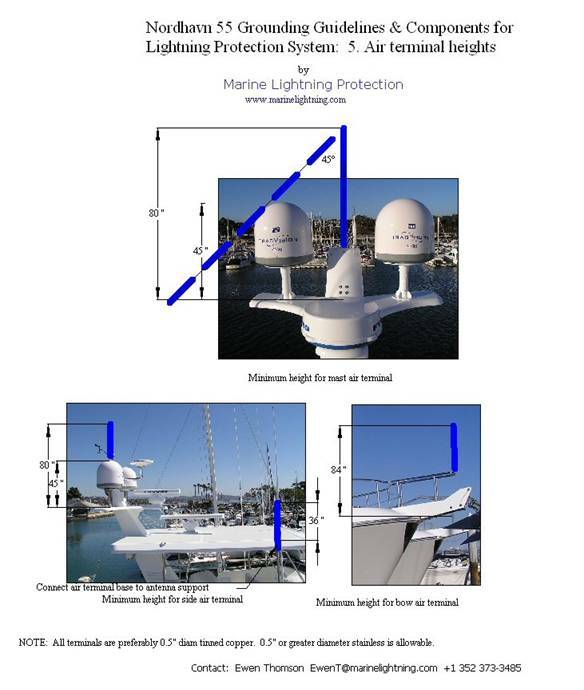 Note however that the lifelines do not meet the specifications of a main lightning conductor. The existing ~1"x3/16" copper bonding strap for cathodic protection is continuous from port stern around the bow and back to starboard stern. A connecting conductor (as described in Section 3.1 ) should be connected between the ends of this bonding strap to ensure a continuous loop that satisfies the specifications of a main lightning conductor. ABYC Standard E-11 stipulates a common connection for DC ground, AC ground, cathodic bonding ground, and lightning bonding ground, so that this bonding loop can also be used in the lightning protection system to connect all down conductors and grounding electrodes. All lugs are for 2AWG cable and have a 3/8" diameter hole. The manufacturer's directions for connecting cable to lug are included in Appendix 8. For better electrical continuity, 0.1-0.3 ml of PenetroxE joint compound should be injected into each lug before inserting the stripped cable. Also, application of heat shrink (with a 1.5" cable overlap) is highly recommended to improve resilience and further impede moisture intrusion. PenetroxE should also be applied between surfaces that are to be connected before attachment. Use the 90 degree lugs for any connection that involves a straight through connection, as illustrated in Appendix 2. If a sufficiently large hole can be made through the roof or coaming, the lug can be bolted in direct contact with the bottom of the stanchion base. Attach with either a 5/16 " or 3/8" machine screw (preferably tinned brass, stainless, or bronze) after making a corresponding thread through the center of the stanchion base. Otherwise, use a ¾" expansion stud (preferably tinned copper, bronze or stainless) with a 3/8" hole through the center. Splices between cables can be made by terminating each cable in a lug at the point of the splice, stacking the lugs together and securing with a through bolt and nut. When splicing into a main down conductor, assure that the down conductor lugs are at 180 degrees and the lug on the spliced cable is angled down as much as possible to avoid U-shaped loops. Two flush-head electrodes with parallel connectors are installed near the bow, two mushroom-head electrodes with parallel connectors are installed amidships, and two mushroom-head electrodes with daisy-chain connections are near the stern, as illustrated in Appendices 1,3,4 and 6. Generally, each electrode should be installed above the stationary waterline and below the lowest flange of any nearby plumbing through hulls. In addition, the two stern electrodes should be positioned so that the cable from the electrode to the HStrip is perpendicular to the strip. Each electrode cable is attached to the bonding loop by the shortest path possible, with the lug at 90 degrees to the bonding strap, and using the same 3/8" machine bolt to attach the electrode cable,and corresponding down conductor to the bonding strap. Detailed installation instructions are included with the electrodes. Place each HStrip between the propeller and the waterline at a depth where it will be immersed during all normal modes of operation. The connection from the bonding strap to each HStrip should be made by as direct a path as possible from the strap, through the dasiy-chain Siedarc electrode, to one of the HStrip bolts.. The lightning protection system described in this document is fundamentally consistent with the new standard published by the National Fire Protection Association NFPA780-2008 (Chapter 8). Any departures are considered by the author to be improvements over this revised standard. For example, instead of a single one square foot grounding strip we use two 0.5 ft2 strips that are placed between the fitting to be shielded – the propeller – and the likely current exit path, the waterline. In general, lightning protection systems are limited by the current state of knowledge and no implication is intended that this, or any, protection system will prevent damage or injury.